Mataji Silver Leaves is widely used in sweet dishes and different Ayurvedic products. We are named among the renowned Manufacturers and Suppliers of Mataji Silver Leaves. The Edible Mataji Silver Leaves is machine made from the original silver. It adds the appeal and nutritional values to the dishes. Obtain from us, small as well as bulk quantities of Mataji Silver Leaves at the most reasonable prices. We are one of the most well known manufacturers and suppliers of pure and edible quality Mataji Silver Leaves (Silver Leaves). 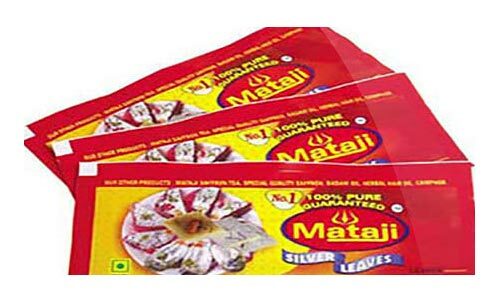 The Mataji Silver Leaves offered by us is frequently used in sweetmeat and different Ayurvedic products manufacturing. The Edible Mataji Silver Leaves is hand made from the original silver and hence very effective for energetic body functioning. The Mataji Silver Leaves when used in the edibles adds the appeal and nutritional values to them. We also offer gold wark ( gold leaves). Benefit : Use in all types of sweet and dishesh.